Inflamed liver, a condition commonly referred to as hepatitis, may be caused by several hepatitis viruses, according to Health Canada. However, other factors, including long-term alcohol abuse, may also cause liver inflammation. Hepatitis may be associated with a variety of symptoms that range from mild to severe. In some cases, liver inflammation may cause serious liver damage. Dietary supplements may help reduce your liver inflammation and improve the health and function of your liver, but these substances should only be used after consulting your family physician. Hepatitis, says PubMed Health, is a swelling of your liver that may be caused by numerous factors, including certain medications and other toxic substances, microbial infections, alcohol abuse and autoimmune conditions, or conditions in which your immune system attacks your liver. Your prognosis, or the expected health outcome of hepatitis, usually depends on the cause of your liver inflammation. An enlarged or tender liver, jaundice and fluid accumulation in your abdomen, or ascites, are common indications of an inflamed liver. Certain supplements have long been prescribed to help relieve your liver inflammation. 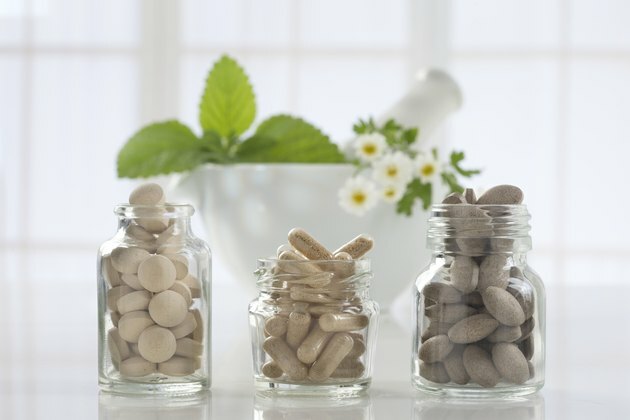 Dietary supplements that may help treat liver inflammation caused by viral infections include alpha-lipoic acid, cysteine, licorice, milk thistle and spirulina, says the University of Maryland Medical Center. Other supplements that have traditionally been used in treating liver inflammation include raw liver extract, lecithin capsules, SAMe, selenium and superoxide dismutase. Some supplements that have been used in treating liver inflammation may require further scientific study to determine their true effectiveness. Milk thistle may be a potent dietary supplement in treating your liver inflammation. Milk thistle, says Memorial Sloan-Kettering Cancer Center, has traditionally been used in treating hepatitis, liver cirrhosis, drug-induced hepatotoxicity and liver disease as well as numerous other ailments, including food poisoning, indigestion and alcoholism. Milk thistle helps protect your liver cells by stabilizing their membranes. Because of this herb's mild laxative effect, it may cause diarrhea in some people. Liver inflammation is a serious health problem and is usually indicative of an underlying health condition that requires medical attention and intervention. If the cause of your liver inflammation is not addressed in a timely manner, you may develop irreversible liver damage. Dietary supplements, though often helpful in reducing your liver inflammation, should be used judiciously. Speak with a clinical nutrition specialist before using dietary supplements to treat your liver inflammation. Are There Supplements That Help With Tendonitis & Bursitis?